Are you ready to debunk some relationship myths? If you’ve had or are having trouble in your relationship, you’ve probably received lots of advice. Sometimes it seems like everybody who has ever been married/in a relationship or knows anyone who has ever been married thinks that he or she actually holds the secret to guaranteeing endless love and happiness. And is always willing to share the information and tell you exactly what the problem is and how to solve it. We enter into relationships with certain beliefs about what good ones are supposed to be like and how we’re supposed to feel when we’re in one. When you think a relationship should be a certain way, and yours isn’t, frustration sets in, you become unhappy and your special someone becomes unhappy too. Each one of us carries ideas around about what a healthy relationship looks like or “should” look like. This typically comes from our upbringing, the relationships we see around us, and more. Yet these common beliefs about “healthy” relationships often create and reinforce stereotypes, many of which can do more harm than good. 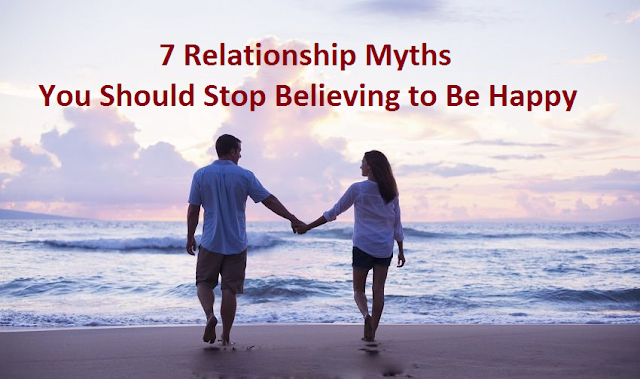 According to Terri Orbuch, Ph.D., a Michigan clinical psychologist and famous writer, the problem with persistent myths is that they can erode a relationship’s happiness… People often believe to relationship myths, which can make their lives so much more difficult and stressful. However, many people find that their relationship becomes less stressful and more fulfilling after they stop believing the sometimes silly relationship myths. There are hundreds of relationship myths and you most probably have heard of and faced a good few of them. But do you believe in those myths yourself? While it is a great feeling to share interests with your partner, it is important to still have interests of your own. In a healthy relationship you will still both maintain friendships, hobbies and careers – spending time with only one person is emotionally unhealthy and can leave you feeling trapped. Falling in love is new and exciting. Chemicals associated with pleasure (like dopamine) are running rampant in our brains. As time goes on, however, these chemicals fade. We become more comfortable with our partner and the newness wears off. Does this mean you should call it quits? Not necessarily. There comes a time in every long-term relationship when it can no longer run on the new “in love” head-over-heels feelings. There are many ways to rekindle the romance, just browse the internet! The one thing that couples fight about most is nothing. These fights result fromfailed bids to connect emotionally. In these small moments, it’s important to turn towards instead of turning away. Living as if your soulmate will complete you will only lead to heartbreak. The illusions that you project onto your soul mate will inevitably fall apart when they sometimes behave in a manner that is not supporting you. A soulmate can be one person or several people in your life that fully complement you and help you find your own wholeness. Having a baby is an amazing experience that will change your lives in every way. It is also the most stressful thing you could possibly do to a relationship. If your goal is to be too exhausted to argue, then procreate away. But if you’re already having problems, you should deal with them directly and not expect a baby to make them disappear. Marital satisfaction almost always dips after the birth of a couple’s first child; take that into account when doing family planning. Of course, relationships take work—and lots of it. You’re merging your own life, needs, wants, desires, dreams, and hopes, all of which shift and change over time and in response to various circumstances, with those of another person whose separate needs, wants, desires, and dreams also shift and change. How else is such a complicated endeavor possibly supposed to succeed unless you both work at it? How much work it actually takes might ebb and flow, but expect toinvest attention and work even in the best of times. We are all human, no one is perfect and neither are the relationships that we create. Relationships are truly about growth and support. We need support to grow and we need to support our partner so they can grow, and sometimes this can be a lot of work. Relationships take a conscious effort to build and protect, there is no such thing as a relationship that is always happy and perfect, despite what you may see on your social media feed. There are happy times in relationships but there are also hard times too. Know that this is normal and all part of the process.